The new Australian five-dollar polymer banknote was issued on 1 September 2016. It retains the portrait of Queen Elizabeth II, which is drawn from the same source photograph represented on the first polymer five-dollar banknote. 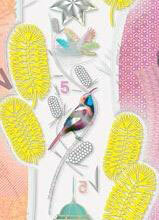 The note features different species of Australian wattle and a native bird. 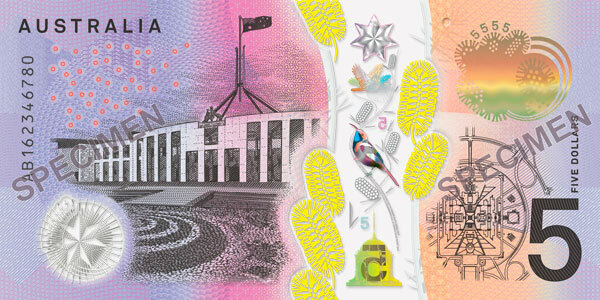 The banknote also depicts New Parliament House and the Forecourt Mosaic, which is based on a Central Desert dot-style painting by Michael Nelson Jagamara titled ‘Possum and Wallaby Dreaming’ and a schematic plan of the New Parliament House. This was based on the Design Development Landscape Plan, which was provided by the Parliament House Construction Authority. Look for multiple security features in the clear top-to-bottom window. The window should be an integral part of the banknote and not an addition. Check that the security features in the window cannot be easily rubbed off. Tilt the banknote to see a three-dimensional image with a colourful border. The image will appear raised or recessed. Tilt the banknote to see a bird move its wings and change colour in the top-to-bottom window. Tilt the banknote to see colours change within a bird. Tilt the banknote to see a number change direction within the building. The number alternately appears forwards, disappears, then appears backwards. Tilt the banknote to see a rolling colour effect. On one side of the banknote it is a prominent patch near the top corner on the other side it is within a bird shape. Look for an image in a small clear window. The image is embossed and has a light and dark effect. The window should be an integral part of the banknote and not an addition. Feel the distinctive texture of the dark printing. The slightly raised print can be felt by running a finger across the portraits and numerals. Multi-coloured and multi-directional fine-line patterns appear on each side of the banknote. This background printing should be very sharp. Check for irregularities such as less clearly defined patterns, thicker or thinner lines, or colour differences. There is microprint, or tiny, clearly defined text, in multiple locations on the banknote. To validate the UV fluorescent features on Australia's banknotes, it is recommended that a UV black light with a wavelength that is centered around 365nm be used, and that it is done so in low ambient lighting conditions. Many UV black lights that use Light Emitting Diodes (LEDs) emit wavelengths between 395 – 400nm, which are not suitable for viewing the UV features.